Gretings from Guatemala’s Highlands…wish you were here! Photo taken right outside my Spanish school in Xela, Guatemala. I met Maria, a local Mayan woman, my second day in Xela. 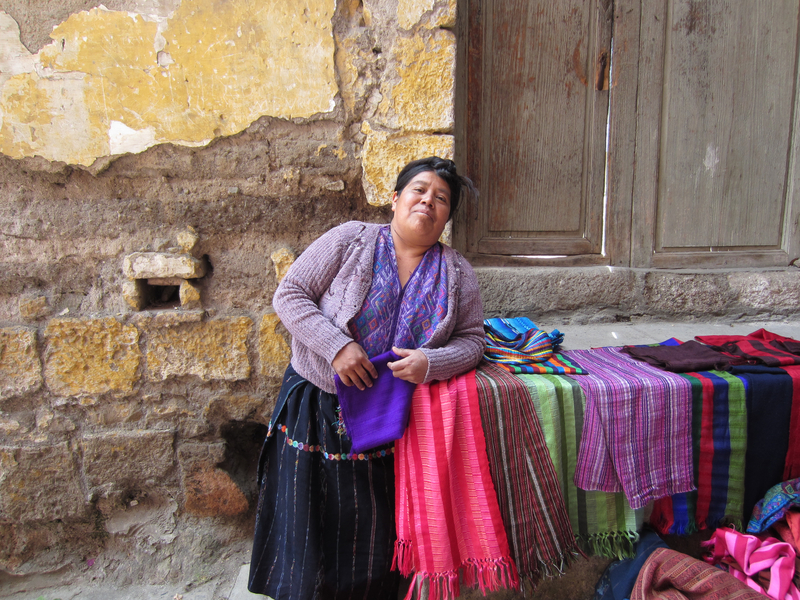 She came to Casa Xelaju Spanish School and set up shop right outside the door, in the lovely alleyway between the school and two traditional homes. Mayan women, the indigenous people of Guatemala, are known for their elaborate, colorful weaving. I could hardly believe my luck to have someone like Maria right outside my doorstep! During our class break, I went outside to watch her perform her craft. She was working on a new table runner which was awash in hues of brilliant blues, yellows and purples. If all went smoothly, it would be completed in less than an hour. Maria proudly showed me her collection of gorgeous, intricate work. Each piece of weaving was a work of art. I marveled at her pride and artistic ability that had been passed on for generations among the Mayan women. We talked and she was so cheerful and optimistic. Of course I bought a lovely red table runner from Maria and she was delighted by my love and admiration of her work. If only I could have bought more! Thanks Kathy! I love it too! Nicole, it’s such a shame we didn’t have enough time to browse the artisan market in Antigua. It’s crammed with colorful textiles and is screaming for photos to be taken! I love the way Maria is leaning and looking deeply into the camera. Thanks Karyn! I would love a KIWI postcard! please send one whenever you are ready! Hope you are well!